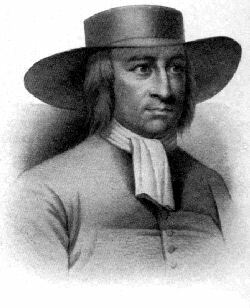 George Fox (1624�1691) was a famous English Dissenter and a founder of the Religious Society of Friends, commonly known as the Quakers or Friends. Quakers believe that everyone may have direct experience of God, and that there is "that of God in everyone". There are no creeds or paid priests and ministers. He was born in Leicestershire and began to preach in around 1647, taking in different places in England. He was imprisoned several times, the first at Nottingham in 1649 and again in Derby in 1650 he was imprisoned for blasphemy. George Fox visited Tickhill in 1651: "When I came [into the church], I found the priest and most of the chief of the parish together in the chancel. I went up to them and began to speak; but they immediately fell upon me. The clerk took up his Bible as I was speaking, and struck me on the face with it, so that my face gushed out with blood; and I bled exceedingly in the steeple-house�They afterwards dragged me through a house and into the street, stoning me and beating me as they dragged me so that I was besmeared all over with blood and dirt.� He was later invited to press charges but declined � apparently the penalty for hitting someone in church at that time was to have your hand cut off!" In 1652, Fox preached for several hours under a walnut tree in Balby Orchard, where his disciple Thomas Aldham (of Balby) was instrumental in setting up the first meeting in the Doncaster area. Thousands came out to listen to him. A chair in the present Doncaster Meeting House is made from wood from this tree, and a table made from it was sent to America in 1967. George Fox and Thomas Aldham, were mobbed and imprisoned in Doncaster because of their refusal to accept social differences and the authority of the established Church. He refused to accept any class distinctions - thus making him and his like-minded friends unpopular with the establishment - both the church and the state. He fared little better in Doncaster market, where Fox was dragged to the ground and taken before magistrates who told him to leave Doncaster and never return. Even on the way out he was stoned in the streets, along with an inn-keeper who took him into his house for safety. The first Balby Meeting House was built on what is now Quaker Lane, Warmsworth (then part of Balby) by the son of Thomas Aldham. Towards the end of the 18th century, the group Friends in Doncaster began to meet in a private house in French Gate rather than go to Warmsworth. Then, in 1800, Friends from Doncaster and Warmsworth moved to a converted barn on the lane from French Gate towards Hexthorpe. In 1975, the meeting moved to its present site as part of the town centre redevelopment.